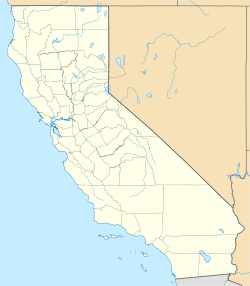 Russell City (also known as Russell) was an unincorporated community in Alameda County, California, USA, about 10 miles (16 km) south of Oakland in present-day Hayward. The land is at an elevation of 16 feet (5 m). The city was named after Frederick James Russell, who laid out the town in 1907. It existed from 1853 until 1964, when the last of the residents were forced out to make way for an industrial park, with such parks dominating the area to this day. During the time the residents fought removal under eminent domain statutes, many of the buildings were destroyed by acts of arson. The city was an arrival point for immigrants to the San Francisco Bay Area. During and after World War II it had its largest growth period, with significant numbers of African Americans moving there from the South. The city had a history of blues music and this heritage is the basis for the annual Hayward/Russell City Blues Festival. Russell City also had a large Latino community made up of Mexicans and Puerto Ricans. Many Latinos immigrated to Russell City during World War II. Some were braceros and others shipyard workers at Todd Shipyards and Kaiser Shipyards in Richmond. Ernesto Nava, son of the famous Mexican revolutionary leader Pancho Villa, lived in Russell City and was one of the last residents to leave. The Russell City Energy Center, a natural gas fueled power plant, opened in 2013 within the city's former boundaries. ^ Durham, David L. (1998). California's Geographic Names: A Gazetteer of Historic and Modern Names of the State. Clovis, Calif.: Word Dancer Press. ISBN 1-884995-14-4. This page was last edited on 9 January 2019, at 02:51 (UTC).